What Top Fitness Amenities Fit Your Lifestyle? Fitness amenities are almost a universal offering in retirement living communities. It seems that these days almost everyone is offering something, but for most of us, something is not enough. Maybe you’ve grown accustom to a certain workout routine that works well and keeps you motivated. Or maybe you’re the type that needs a little variety to keep you interested. Getting a good walk is the dark horse of the fitness world. Most folks do not understand how beneficial walking can be, not just for our physical health, but mental health as well. Walking is enough exercise to produce a protein in the brain that has a direct influence on memory and cognitive ability. It’s not just preventative maintenance; the protein can also work to reverse memory impairment. Two 10 minute walks is ideal for this purpose, but one 20 minute session is also functional. At least 5.7 miles per week should be covered to get the desired mental health impact. Kendal at Oberlin offers outdoor walking trails and covered walkways for residents to get out there and improve their body and mind. There’s not enough room on the internet to hit on every benefit that swimming provides to the human body. 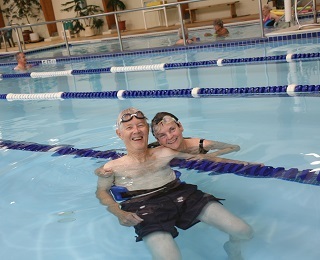 In older adults some of these unique aspects of swimming become even more advantageous. The density of water is great for minimizing joint fatigue as tendons and ligaments break down during the human body’s maturation process. Compared to treadmills, walking in a pool is virtually free of joint stress. As a result, fewer injuries will occur from pool exercises. Swimming increases the flow of oxygen to the entire body. Every major muscle group is worked in a swimming pool. Fat is burned, muscles are toned and even bone density is improved to fight against diseases like osteoporosis. Going for a swim has been shown to relieve stress and improve mood. As an aerobic exercise, swimming just 30 minutes a day five days a week is great for heart health. You’re also sure to have social interactions with other residents at the pool that will prevent any feelings of isolation. In any event, it’s always nice to have the supervision of a professional. A personal trainer not only ensures your safety, but also that your exercises are properly executed which leads to maximum results. Personal trainers are a great source of motivation to keep your efforts high. Are you doing enough to improve your mind and body?